A high bounce rate has kept many website owners up at night, tossing and turning, seconding guessing their efforts and asking themselves that age-old question: “where am I going wrong?” It’s painful to see a significant percentage of your website traffic arrive, look around briefly, and leave again. It plays on our natural human fear of rejection. Before you sink into the depths of despair though, it helps to put it all into perspective. Average bounce rates vary wildly by industry and type of site or landing page, but 40 – 60% seems to be an acceptable rate for many websites. Don’t get too hung up on the actual number, but instead, look at the trend to identify increases or decreases that indicate any activity or experiment you are carrying out is having an effect. 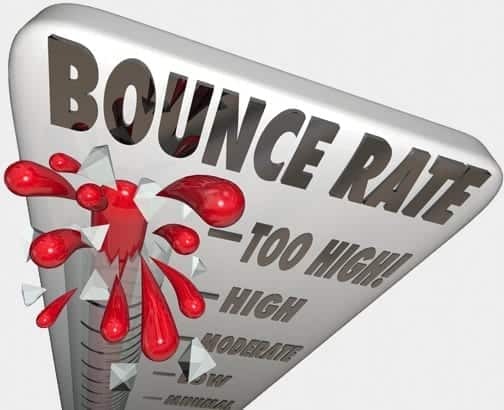 This is always a safe first port of call to check if you are seeing a higher than normal bounce rate. Is there a script, image or other resource that is causing a delay? In today’s fast paced world every second counts! Trim bloated code, keep additional plugins and scripts to a minimum and regularly check for any errors that might creep in to slow your site down. Your website will be experienced very differently depending on what size and type of device a visitor is using. In an ideal world you could create a different version of your site customized for desktops, tablets and smartphones, but at the very least you should have a mobile friendly version of your site that still looks great and is easy to navigate when just 300px wide. It’s also a good practice to skip serving pop ups to mobile visitors and steer clear of Flash to avoid iPhone and iPad users encountering missing media. Don’t distract visitors from the primary reason they came. Animated banners, pop ups, too many in line ads… all of these can create unwanted noise on your pages and cause a visitor to leave in frustration. Keep content focused and useful, well laid out and easy to read for a better user experience. A “bounce” means someone arrived at your webpage and then left without clicking on any other link. So it’s important to give them something to click on. Make it clear where you want them to go next, and ensure that your call to action text give them a great reason to do it. Easy ways to increase the stickiness of your site include showing recommendations to similar pages or posts, adding a newsletter sign up to the sidebar or header, or including a link to an offer or resource in your content. Remember those “choose your own adventure” books? Perhaps not. The same principle of being in control of a character is what makes video games so addictive, and this desire to control our path can also be applied to content to make it more interactive and interesting. Consider adding quizzes, slideshows or different recommended resources for a visitor to engage with. Even a simple on-page navigation menu with anchor links to key sections of the page will allow your visitor to quickly jump to the information that is of most interest to them. As you try some of these tips, bear in mind that a high bounce rate is not always a bad thing. If the people who do stay have a high conversion rate, and your overall traffic is increasing then you are reaching the right people and the majority of those bouncing may just not be the right audience for you. This article was contributed by Ian Mills, CEO of Magicdust, website development company based in Sydney.